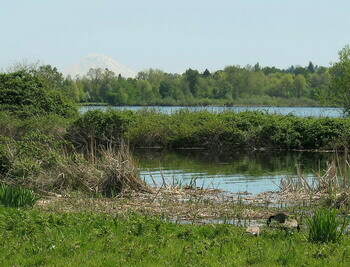 The Union Bay Natural Area, or "Montlake Fill", is one of the premier birding sites in Seattle, because it is an island of wild in a sea of urbanity. The "fill" is a former landfill located in the heart of northeast Seattle on the banks of Lake Washington. It was built on a peat marsh created when Lake Washington was lowered in the early 1900s. When the landfill closed in 1966, the city capped the garbage with clay, covered by a thin layer of soil. Over the years, the land has settled into gentle hills and valleys landscaped into grasslands, with riparian vegetation and marshes. Various temporary and permanent ponds have formed, surrounded by poplars, willows, cattails, and invasive plants. The University of Washington, which owns and manages the property, is currently trying to seed the site with native vegetation, but much remains to be done. Union Bay Natural Area is noted for its microhabitats, which attract a huge diversity of resident and migratory birds. Some 200 species have been seen here over the years, including such delights as American Bittern, Yellow-headed Blackbird, Peregrine Falcon, Merlin, Green Heron, American Pipit, and Rufous and Anna's Hummingbird. The ponds attract migrating shorebirds such as Wilson's Phalarope, Stilt Sandpiper, Semipalmated Sandpiper, Pectoral Sandpiper, Baird's Sandpiper, and Solitary Sandpiper, along with the more common Leasts, Westerns, and dowitchers. Rarities can turn up at any time and include Black-headed Gull, Clay-colored Sparrow, Black Tern, Barn Owl, Sage Thrasher, Chestnut-collared Longspur, and Lapland Longspur. Waterfowl such as Cackling Canada Geese, Wood Duck, Hooded Merganser, and wigeons (both species) are common. The best feature about this area is that the birds quickly become accustomed to people and allow birders to approach closely. From I-5, exit at #169 (NE 45th Street) and head east on NE 45th through the University District and down a viaduct ramp to a stoplight. Keep heading east on NE 45th to the next light (Mary Gates Memorial Drive). Turn right and head south, passing the first turnoff on the right (Golf Driving Range) and entering the next turnoff, which is the entrance of a small parking lot for the Center for Urban Horticulture (CUH). Parking is free here. There is no entrance fee. Walk the loop trail on the west side of this parking lot (Wahkiakum Trail). You can also explore the grounds south and east of CUH, and the fields and ponds north of Wahkiakum Trail. Good year round; early mornings are best. No amenities available at the Union Bay Natural Area, but if the CUH is open, restrooms and vending machines are available. Avoid University of Washington football Saturdays, as parking is difficult.